On December 10th 2009, in a small village of Bil’in, north of Ramallah in the West Bank, the home of 39-year-old school teacher Abdallah Abu Rahmah was raided by Israeli military forces who blindfolded and tightly fastened his hands together with zip tie cuffs. Frightened and confused, his wife and three children could only watch as he was hauled out of his home into the cold winter night and taken away in one of the seven military jeeps. Almost nine-months later, having been imprisoned in weather-beaten tents at the Ofer military detention camp, prosecutors (failing to provide a single piece of documentary evidence) convinced a military courtroom to convict Abdallah Abu Rahmah for his involvement in coordinating “illegal” weekly marches and “incitement” with the Bil’in Popular Committee Against the Wall and Settlements. These charges, although unreasonable, are not as ridiculous as the ones he was acquitted on, which were taking Israeli tear gas grenades and canisters (weapons that recently killed activist Basem Abu Rahma and have injured others) to create an artistic peace sign. Protests against the conviction have already begun with large gatherings outside Bil’in where many waved Palestinian flags and yelled out the injustice in Arabic and Hebrew. Israeli soldiers hiding behind clouds of suffocating smoke and ballistic shields regrouped to drive off the demonstrators. 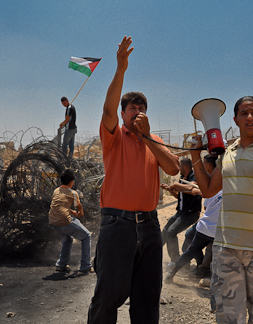 Since 2004, Abdallah Abu Rahmah has organized and led Bil’in demonstrations with the grassroots movement Bil’in Popular Committee that pushes for nonviolent resistance against the illegal fence/wall and the Israeli occupation. These nonviolent movements have become inviolable and more widespread in the West Bank over the years. Despite human rights violations, Israeli soldiers continue to arrest, kidnap, torture, threaten with deportation or even kill those who demonstrate for self-determination. Within a country that speaks to Palestinians with firearms, bulldozers, and land encroaching, Abdallah Abu Rahmah has been lauded by many as the “Palestinian Gandhi” for his devotion to maintaining a nonviolent stance as he leads the movement. But now Abdallah Abu Rahmah is facing up to 10 years imprisonment for “legitimately exercising [his] right to freedom of expression in opposing the Israeli fence/wall,” according to Amnesty International. The first appearance of movements taking up Gandhian tactics in the struggle against Israel’s control was during the 1967 the Six-Day War. After Israel occupied the West Bank, Gaza Strip and East Jerusalem, Palestinians countered with acts of civil disobedience against biased textbooks that Israel issued for Palestinian schools. Many protested in the streets, others closed down their businesses and teachers stopped showing up for work. Israel then adapted by criminalizing all forms of resistance, which limited Palestinians. Decades later this remains the same. When Palestinians, Israelis or internationals confront Israeli forces, soldiers are trained to respond with violence by indiscriminate usage of sound bombs, rubber coated bullets (Abdallah Abu Rahmah, like many others, has been intentionally targeted and even shot in the head by these so-called “non-lethal” bullets), live ammunition, tear gas canisters, baton beatings and water cannons. This is done regardless if Palestinian youths instigate with stone-throwing (something that Abdallah Abu Rahmah is unable to control) or keep their demonstrations entirely peaceful. Nonviolence that’s practiced by Palestinians is met with intensified violent measures from Israeli soldiers. These disproportionate methods of aggression against the Bil’in Popular Committee’s unarmed struggle are an ongoing attempt to stoke fear, intimidation and to break the will of the community resistance group in the West Bank area. Special diligence should be given to the probability that Israel may want to provoke another armed uprising. This would then be used to mislead the public and build support for the use of Israel’s overpowering military against Palestinians. Up against growing opposition from international diplomats (some from the US, Germany, Sweden and Spain), the Israeli government is running out of excuses for what it has done. As they repeatedly use violence while masking their crimes with lies, they gradually lose the little creditability they have. The mounting pressure from nonviolent movements in the face of the Israeli government will only garner sympathy from others who renounce the Israeli occupation. We are engaged in an international fight against oppression […] Ordinary people enraged by the occupation have made our struggle their own, and joined us in solidarity. We will surely join together to struggle for justice in other places when Palestine is finally free.